The ccMiner software miner for Nvidia GPUs has received another update of the source code this time adding support for the X11 algorithm for GPU mining crypto currencies such as DarkCoin. We have compiled a binary for Windows that you can find below and try on your Nvidia GPU. It seems that the performance that the current code for X11 offers on Nvidia hardware is pretty similar to what you can get on AMD. On a GeForce GTX 780 Ti we are getting hashrate of about 2.8 MHS when mining DarkCoin. I am using this build to mine Darkcoin @ drkpool.com. However, it’s not accepting shares. Any idea? Tried this on darkpool.io – seems to hash on 560TI, but the pool does not see any shares submitted on the other end. Anyone else tried it with pool.darkcoin.io:3333 ? I tried this on 750 Ti – works, 1.5 Mhs/card. @Alec: Have you downloaded/installed the Visual C++ Redistributable for Visual Studio 2012 as stated in the post? That missing .dll seems to be related to not having the proper redistributable installed. how the heck do i fix it? I’m running it on a GTX 560 Ti and getting 1400 kh/s at stock clock speeds. Pretty good considering my 750 Ti’s are doing about 1700 kh/s. Got my GTX660 running stable at 1.4 MHs using Jason’s link up here. Got the DLL worked out, be sure to download the X86 package from windows. The program runs great now, however my pool doesn’t see any of my hash rate. 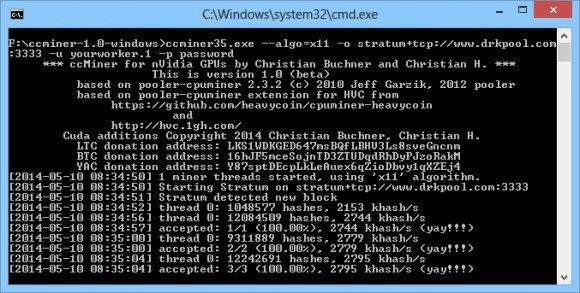 Alec, make sure you are starting the right version of ccminer for your hardware, based on the Compute version support of the GPU you have. What is error “GPU #0: result for nonce $0496DBA9 does not validate on CPU!” mean? I am running ccminer30.exe with NVidia 670 on Windows 8.1 with I7 Ivy Bridge CPU. It is hashing at about 2.0MH/s and everything is fine EXCEPT ‘nonce’ error CPU. ???? Thanks for any input. Does this version not work on XP. I get “not valid 32 bit app” when I try to tart it.